CHICAGO, IL October 15, 2013 - American Steamship Company (“ASC”), a subsidiary of GATX Corporation (NYSE:GMT), and Chicago’s John G. Shedd Aquarium are proud to share their common goal of protecting the Great Lakes—and now they’re taking that message to communities along the shores. 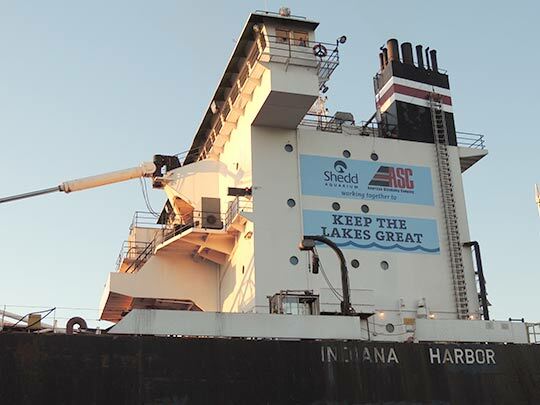 One of ASC’s 1,000-foot vessels, the M/V Indiana Harbor, is displaying each organization’s logo along with the slogan “Working Together to Keep the Lakes Great.” The vessel travels throughout the Great Lakes region including ports in western Lake Superior, southern Lake Michigan, Detroit and Cleveland. ASC is actively involved in researching ways to stop the spread of non-native aquatic species on the Great Lakes. In an effort to understand and address the issue, ASC has been exploring methods for treating ballast water on ships that operate exclusively on the fresh water of the Great Lakes. Working with Lake Superior’s Isle Royale National Park, the United States Geological Survey, the Northeast Midwest Institute’s Great Ships Initiative and other support agencies, full-scale trials have been conducted aboard the M/V Indiana Harbor over the past three years. Shedd is committed to protecting the Great Lakes by conducting science and research through collaborative efforts with other Great Lakes organizations, facilitating work between Great Lakes leaders that develop solutions for tomorrow’s conservation challenges, and offering immersive learning programs and outreach for all ages. Shedd focuses on four key Great Lakes issues, seeking to build awareness of ecological separation, contribute to solution-oriented invasive species research, accelerate habitat restoration, and protect and promote native wildlife.